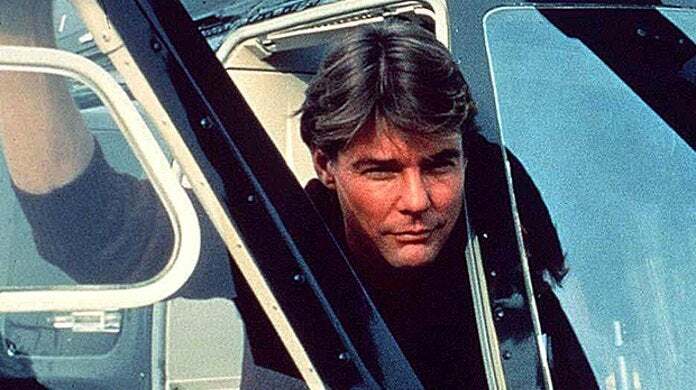 Airwolf star Jan-Michael Vincent is dead at the age of 74. The '80s star actually died back on Feburary 10th, due to cardiac arrest while registered as a patient at a unnamed hospital in North Carolina. As TMZ reports, no deeper autopsy was performed on the body, which has since been cremated. No further details about his death have been given. Vincent was best known for Airwolf, which made him the highest-paid actor on TV ($200K per episode) during the show's three-season run from 1984 - 1986. He never again scored a high-profile role like that again, but a lot of current members of geek culture will probably recall Vincent's name and likeness being appropriated for a sequence in Rick and Morty's famous "Interdimensional Cable 2: Tempting Fate" anthology episode, in which one of the featured programs as an ad for a movie about a post-Apocalyptic planet of Jan-Michael Vincents. In real life, Vincent was serving in the California Army National Guard back in the 1960s, when a talent scout spotted him, based on his looks. He got his first role in the 1967 film The Bandits, which led to him being signed ot Universal Studios, where he ended the '60s with TV roles on shows like Dragnet 1968, Danger Island, The Survivors and Lassie - along with a few film roles. In the 1970s, Vincent gained acclaim playing a hippie drafted intothe Vietnam War in the TV movie Tribes, and added some action movie acclaim to his resume by starring in The Mechanic alongside Charles Bronson. TV movie roles in projects like Sandcastles and Disney's The World's Greatest Athlete would only expand his range. He would appear in films throughout the '70s, ending the decade with highlights like surfing film Big Wednesday and the Burt Reynolds stuntman movie Hooper. The '80s would see Vincent truly hit his stride, with a series of notable film roles (Hard Country, Last Plane Out) and a TV miniseries role (Winds of War) that would tee him up for his biggest career success with Airwolf. Vincent would fade out of the limelight during the '90s, with only small cameos in the TV show Nash Bridges (playing star Don Johnson's long-lost brother) and the Vincent Gallo movie Buffalo '66. Off screen, Vincent's life was marked by moments of serious turbulence, including two failed marriages (the second ending in claims of domestic abuse and a restraining order); multiple vehicular crashes; battles with alcohol and intravenous drug use; as well as legal woes for drug possession, and various assaults (domestic and public) - including one alleged to have caused one of his girlfriends to miscarry. On the health front, Vincent had a brush with death back in 2012, when an infection nearly killed him, ultimately causing his right leg to be amputated, as well as an emergency medical procedure that left his vocal chords permanently damaged, and his voice raspy. We wish his family and friends condolences in their time of grief.